It is important, and increasingly also required for your pet to be identifiable and for your pet's details to be stored. If your pet is missing and someone finds it, for example, it is good to have the details for the pet and its owner. When you want to take your pet across the border, you need to have it chipped so that they can check that you are not importing or exporting illegally caught animals. It is therefore important for combating illicit trade. A chip is also required for pet insurance or a loyalty scheme at your veterinary practice. A chip, or micro-transponder, is a small tube that is about the size of a grain of rice. Your veterinarian will insert this chip under your pet's skin using a needle. The location is usually in the neck, just above the left shoulder. 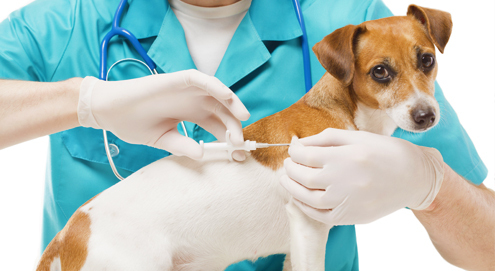 Inserting the chip is relatively pain-free for your pet and is comparable to other injections. What can you do with the chip? The chip contains a microchip that has a registration number on it. This registration number can be read with a special reader. By holding this so-called chip-reader over the place where the chip is located, the registration number will become visible. The chip will not affect your pet in any other way. It does not contain a battery or any other source of energy. The registration number on the chip contains 15 digits. The first 3 digits are the country code. The country code for Great Britain is 826. Placing a chip alone is not enough. It is important that the chip number is registered to a database with the pet's details. That's why we always refer to Identification AND registration. There are various databases that you can have your pet registered to. When choosing a database, don't just look at the price, but also at the options. It is important that you can register your pet under your own name and that you can change the details yourself. It is also important that the database is always accessible! Make sure that you notify the database of any changes in your details, such as a house move or a new phone number. That way, if your pet runs away from home and is found, it can always be linked to you as its owner. If the details in the database are no longer correct, the chance of your pet finding its way back to you is quite small. Is chipping required for my pet? In England, Wales and Scotland, all dogs older than 9 weeks must be registered since 6 April 2016. If you want to take your dog, cat or ferret abroad, registration is also compulsory. Since 3 July 2011, chipping is compulsory within EU countries. Breeders must ensure that all puppies born after 6 April 2016 are chipped before the age of 8 weeks. This can be done by your veterinarian or someone trained in microchipping before 29 December 2014 and with practical experience. The breeder is also required to be the first registered contact on the database and recorded as the breeder before the age of 8 weeks. If you are getting a puppy abroad, you must register the puppy in your name and with your details. The puppies must already be chipped in order to get into Great Britain. To register a microchipped pet from overseas, you can use the Kennel Club application form. You can find this application form here. I don't remember where my pet is registered and whether the details are correct, what do I do? You can enter your pet's chip number at Pettrac.co.uk to see where your pet is registered and under what details. Why place a chip, rather than a tattoo for example? A chip is animal-friendly and easy to read. What's more, the registration number is unique and fraud-proof. Removing it is difficult and the registration number cannot be changed. A chip is suitable for nearly all animals and even young animals can be chipped. Your pet cannot feel the chip and it will not affect your pet's health. PLEASE NOTE: A registered chip and pet passport are not valid as proof of ownership! Trendy ID tag with cheerful pendant for girls. Trendy ID tag with cheerful pendant for boys. Trendy address tube with cheerful pendant. Address tube with strass stones.